My two favorite holidays are Independence Day and Thanksgiving. I love July 4th because I’m a natural-born pyromaniac, and I live far enough from civilization that I can light fireworks to my heart’s content. But I love Thanksgiving because it remains the least commercialized of the American holidays. I usually spend a quiet day cooking, reading, and walking in the woods. Since I’ve been keeping this website, I’ve always acknowledged the bees on Thanksgiving day. I thank them for providing us with the stunning array of foods we eat, the flowers, the trees, the seeds and all the other things they provide for us. And when I say bees, I mean all of them, from the tiniest Perdita to the great carpenters and everything in between. To them, I am eternally grateful. Although the bees have given me the subject of this website, it is you, the readers, who have given me the reason to keep going and to persist in spite of an endless string of obstacles. Today is the day for me to thank you. If I had known how difficult it would be to maintain a website like this, I would have never started. And this year has been the hardest yet. The Internet is a scary place in many ways, and a self-hosted website is nothing but a target. You become a bullseye for spammers, for denial of service attacks, for malware, for worms and viruses, and for just plain nastiness. And the bigger you get, the more the bad guys notice. From the outside, it may seem like most of my time would be spent writing and researching, but it’s not like that at all. In the beginning it was, and back then I posted nearly every day. But the site evolved in a way I didn’t envision, and now I spend the bulk of my time answering beekeeper questions. However, the biggest part of my adrenaline reserve is wasted on wondering where the next attack is coming from and what form it will take. I’m a wreck every time I access my site, wondering if it’s still there, and trying to decide what I will do if it’s not. I have a knot in my stomach that never goes away. At least three times this fall my site was down for the better part of two days in a row, and each time I wondered if I would ever get it back. It’s a crazy, helpless feeling when the thing you’ve built for seven years just disappears. So the little website that was almost free in the beginning now runs up an incredible tab. I pay for professional grade hosting and backups and spam filters. I pay another company for a firewall, malware detection, monitoring, and a second set of backups. And I pay another company for high-speed Internet and another firewall. And because of reliability issues, I also pay to have my subscriptions delivered. In addition, I’m in the process of adding a photo site to store and distribute the photos you keep requesting. It’s a spiral. And I’ve just been told I should hire a professional to optimize the site, due to a seven-year accumulation of useless code that gets in the way. I made a promise to myself right from the beginning, that I would keep this site secure for both me and you. I never want a reader to worry about malware or viruses. I’ve vowed to keep the content polite, civil, and as accurate as possible. I vowed to have no garish display ads or pop-ups that push the text out of view or prevent you from leaving. In fact, anything that bothers me as a reader is permanently banned. So when Thanksgiving rolls around each year, the people most in my mind are the donors who have kept me up and running for another year. I can guarantee that without your generous support, this site would cease to exist in a heartbeat. And as I’ve explained to many of you, it’s not only the money but the vote of confidence that a donation provides. Your votes keep me slogging through the bad times, the blank screens, and the nasty emails. To you generous folks I send my heartfelt thanks and a sincere wish that your Thanksgiving is filled with joy and happiness. 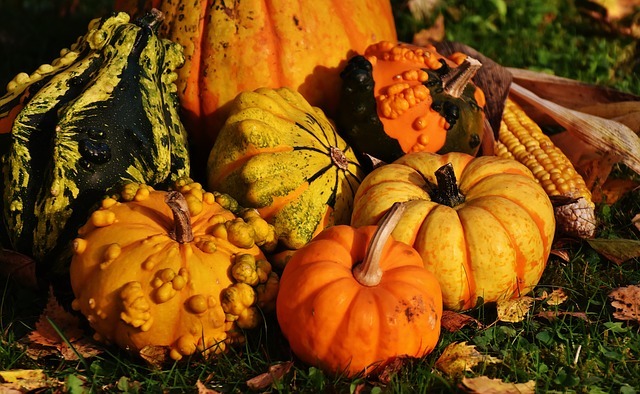 Bees of many types pollinate pumpkins and other squash. Pixabay photo. You’ve got that right, owning a website turns from creating content for fun into a crash course in coding, security, optimization and so on very quickly. After a while it’s exhausting enough just trying to keep the thing up, let alone write. Regardless, you’re doing a great job and I’ve enjoyed coming here for a lot of very helpful information on keeping my two hives going. Though I’ve been keeping bees for several years, I still consider myself a newbee. One of my biggest frustrations in getting competent has been the wide range of suggestions and information, some not much better than opinions. I find your site to have the right mix of science and experience to make it credible and useful. Happy Thanksgiving from your neighbours to the north in Victoria B.C. I never guessed it was so difficult, with so many nasty people going out of their way to cause harm. Thanks again for the great photo and explanation of it for my Poughkeepsie Journal article. And thank you for sending me the cut-sheets. They are fun to see. I’d like to wish you a happy Thanksgiving, and say thank you for all the good information and encouragement that you provide for other (especially new) beekeepers. I’m know it’s a giant hassle contending with maintaining a site like this, but please keep up the good work. Rusty, I hear your frustrations, but I for one would be devastated if you were give up this website. It is gospel truth for me, and I hang on your every word. Keep up the good work, and I will be sure to keep up with donations. If the world had more people like you it would make a difference, I really look forward to your posts popping up in my inbox, As you said above “I’ve vowed to keep the content polite, civil, and as accurate as possible. I vowed to have no garish display ads or pop-ups that push the text out of view or prevent you from leaving. In fact, anything that bothers me as a reader is permanently banned”. You have succeeded in achieving the above. Enjoy your day. and all your heart might desire. Take care and thanks for all the posts. Thank you, Edward. I’m glad you think I’m succeeding. From my heart: a very happy Thanksgiving to you too, Rusty! Rusty, we are enormously thankful for your work and wit and devotion to bees – yes, all of them, even the tiny anonymous ones still foraging a few hardy white aster blooms when I went out to feed last night. Thank you for helping us to see our miraculous world and its creatures with clearer eyes! My Thanksgiving is long over, as I live in Canada, but I want to wish everyone south of the border a wonderful Thanksgiving day. And a special thanks goes to you, for being one of my favourite resources; as a new beekeeper, I’ve learned so much from this site, including a list of books that I need, in order to further my understanding of these beautiful and complex creatures. I should put Canadian Thanksgiving on my calendar. My husband (a Canadian) usually reminds me, but sometimes not. Anyway, I hope yours was a good one. I am thankful that you run this website and that I found it. You have created a wonderful community of helpful beekeepers. I am sorry that you have to worry about the site in addition to worrying about your bees. Happy to donate. Thank you and have a relaxing worry free Thanksgiving. Thank you so much. I agree that the people who write in and share their questions and experience are awesome. Such an excellent group. Happy Thanksgiving! Your website is one of the things I am thankful for. It is one of the most valuable beekeeping websites on the internet in my opinion. I appreciate your honesty and candor in this Thanksgiving post. Not being very “literate” in the intricacies of the internet I never dreamed what was involved in maintaining a site such as yours. I worry enough about just getting my e-mail hacked. Like so many other things I just took your webpage for granted. Your post is an eye opener. Thanks for a great website and all you endure to keep it going. I will miss it if it very goes away. You just got added to my list of things worth supporting with a donation. Thanks, Bob. I debated if I should mention the hassle, but it’s become such a big part of my daily life that I decided to spell it out. I very much appreciate your support. Happy Thanksgiving Rusty and Mr Rusty! 🙂 I appreciate the effort that both of you must put in to making this one of the most balanced and informative web sites on beekeeping and honey. The mix of science and real life experience is very valuable to me, plus you know how to write in an engaging, informative and entertaining style. I have shown my gratitude with a donation, and I hope that many others will do the same, so that we can continue to benefit from your insights, knowledge and experiences. Mr. Rusty and I got a good laugh over that. We have different last names, too, and he hates being called Mr. Burlew. And thank you for the donation! You are so appreciated. I wonder whether WordPress or a similar blogging site would be a cheaper option for you. WordPress costs me virtually nothing and in terms of structure and features (though not writing quality – yours is far superior and more frequent! – my site is fairly similar to yours. Admittedly the costs will change soon for me as five years after starting my blog I’ve hit the 3GB upload limit for photos and face the difficult decision of whether to spend around £60 annually on extra photo hosting. I am very grateful for the effort you put in to producing and maintaining a top-rate website! At 70 years old, I’ve just started keeping bees. This is both a Science and an Art. I’ve attended classes to learn the Science of beekeeping. Your website is helping me (so very slowly) learn both the Art and the Science of beekeeping. Art is not learned; it is developed over time. At times I wonder if I have enough time for the Art to grow. I am so enjoying this new adventure. You are right, it is both an art and a science. And 70 is an excellent time to get started: you have lots of life experiences to apply! Although this is not strictly about bees, it follows the vein of bees eating fruit and other critters eating foods not expected in their usual diet. This morning, Saturday after Thanksgiving, we saw a Coyote eating apples under one of our apple trees. It was a good looking one, did not appear starved at all, full body & fur. It picked up one, went across the yard and ate the whole apple, then went back for seconds and thirds. This was a first for us to see one in our front yard and certainly a first to see it eating apples. Animals are always surprising, like my cattle dog that eats mulberries right off the tree. So undignified! Well said Rusty – just ignore the Angry Internet Men, they are lacking in other areas of their lives.